Support in Canada continues to grow for a Delhi University Professor who is incarcerated in an Indian jail despite being ninety percent disabled below the waist. After the World Sikh Organization (WSO), the Alliance Against Displacement joins the list of Canadian groups who have raised their voice for wheelchair bound GN Saibaba, who was given a life sentence last year. Saibaba has been advocating for the rights of the oppressed groups and indigenous communities in India. He was charged for being a supporter of Maoist insurgents active in the tribal areas. Saibaba had mobilized public opinion against growing state repression of the indigenous peoples, who are being displaced from their traditional lands by the extraction industry with the backing of the Indian government, forcing many to join Maoist movement. His family and friends believe that he has been framed to silence any voice of dissent from civil society. They apprehend danger to his life as he has multiple health issues. On Monday April 30, Alliance Against Displacement organized a conversation on the criminalization of indigenous people and racialized communities, in the Dr. Ambedkar room of Surrey Central Library. The organizers included anti-poverty activists Dave Diewert and Ivan Drury. Among the participants were members of visible minority groups who shared their experiences of racial profiling and police high handedness. Incidentally, Dr. Ambedkar was a towering social justice activist of India, who had dedicated his entire life for the empowerment of depressed classes. During the event, the participants were told about the case of Saibaba, who has always stood for religious minorities and indigenous communities, following which they held out “FREE SAIBABA” signs to show their solidarity. 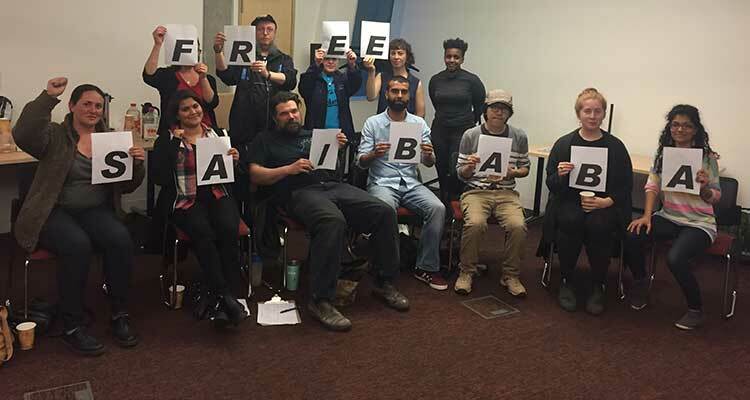 Not long ago, seniors with disabilities at the Progressive Intercultural Community Services in Surrey also did the same by posing with “FREE SAIBABA” signs before the camera. Earlier, WSO came out with a statement expressing its concerns over the deteriorating health condition of Saibaba. As one of the largest Sikh advocacy groups in Canada, WSO has been raising the issues of political prisoners in India even in the past. Likewise, Khalra Mission, a human rights group established in memory of Jaswant Singh Khalra, a Sikh activist who was kidnapped and murdered by the Indian police in 1995, has also expressed its support to Saibaba. The slain activist’s son, Janmeent Singh Khalra, lives in Calgary and has been raising the issue of Saibaba through social media. A petition asking for the release of Saibaba on compassionate grounds has received 1,000 signatures in Canada. Most of these signatures were collected during the Vaisakhi parades in Vancouver and Surrey last year. Members of the Sikh community enthusiastically signed the petition, which was launched by Radical Desi, and later submitted to at least two MPs, Sukh Dhaliwal and Peter Julian. Federal New Democratic leader Jagmeet Singh and BC Federation of Labour President Irene Lanzinger also made statements in support of Saibaba. Within the academic circles, Seema Ahluwalia, who teaches indigenous studies at Kwantlen College, and Anne Murphy who teaches at the University of British Columbia also helped in raising awareness about the situation of Saibaba.